Zhang Di, a 27-year-old policewoman based in Heilongjiang, received her first wedding gift last month. Instead of a traditional present such as a piece of gold jewelry, she was given a white, knee-length mink fur coat by her husband. “Furs are a must-have for girls in Northeast China. It’s like Barbie or a luxury handbag in the United States. Wearing fur is a fantastic way to stay active and chic,” smiled Zhang. Zhang and her husband are not wealthy enough to splash out the 20,000 yuan ($3,210) the coat cost on a regular basis but Zhang was very happy about this occasional show of extravagance. As a result of the country’s rising demand, the level of fur production in Northeast China has been increasing steadily by 10 percent a year since 2004, industry experts said. According to the International Fur Trade Federation, since 2011, China has become the world’s largest fur production and consumption market. Last year, global fur sales reached a record high of $15 billion worldwide, from $14 billion in 2011. The Chinese mainland, Hong Kong and South Korea are showing particularly significant gains, while in Europe and North America, turnover increased as pelt prices at auction reached record highs. Fur sales in Asia hit $5.3 billion, a year-on-year increase of 10 percent, which reflected a general trend in the luxury goods sector, said the London-based fur trade federation. “China’s swelling fur demand is not only for expensive fur garments but also for trims on wool sweaters or cuffs on leather gloves,” said Mike Oaten, chief executive officer of the federation. “During the week-long Spring Festival shopping spree, which fell on Jan 9, sales of fur coats jumped at least 30 percent,” said Zheng Zi, a fur garment seller in Zhejiang province. Her store provided a large discount of 50 percent or even 80 percent off, but Zheng said expensive fur coats, which generally cost more than 20,000 yuan, are still not affordable for most customers. Industry experts said around 10 years ago most buyers in China were from neighboring Russia, where many people bulk up against the freezing winter by wearing fur. Now the number of Chinese fur lovers is greatly increasing. “The fashion is leading the market. The combination of new techniques with trim and light fur and use of color is very popular on the catwalks. It has come together to create a real excitement in the market,” Oaten said. In recent years, designers in New York, Milan and London have increased the number of their designs in fur, bringing it back into fashion. Oaten added China has a different taste profile for fur. An increasing number of Chinese customers are fond of lighter colors and chic designs. Westerners tend to prefer brown or black with a classic design. “People have developed a voracious appetite for fur of all kinds, including mink, fox, rabbit and raccoon,” said Zheng a fur garment seller in Zhejiang province. “In terms of color and style, pink, green and white are very popular. Young customers tend to buy slim cuts rather than the old loose style,” Zheng added. Zheng said even though sales have been increasing over the past years as people’s living standards have improved, the cost of fur has also risen because of the rising cost of the raw material and labor. “The price of fur clothing kept climbing over the past several years with a year-on-year growth rate of 20 percent at least,” said Spark Fang, marketing executive of Sagafurs, a Finland auction house. Despite the rising cost and shrinking profit, Zheng is still optimistic about the future outlook of his business. “Most buyers are white collar workers. They want to own a piece for special occasions. I think their numbers will be expanding,” said Zheng. 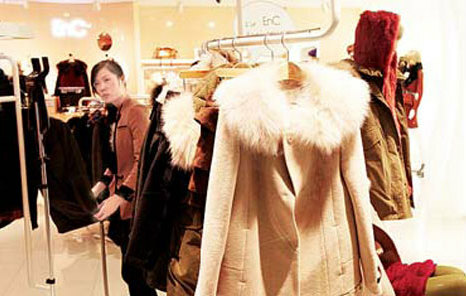 In January, the 39th China Fur and Leather Products Fair was held in Beijing. It attracted a number of European and American wholesalers looking for better commercial fashion garments and accessories. More than 300 fur companies attended the fair and filled the main exhibition halls. “The mild winter and slow economy affected the sales of mink and other luxury fur garments in Europe and North America but sales in China have been growing, both for fur garments and fur accessories,” said one garment seller surnamed Zhao from Nanjing city. According to the China Leather Association, the Chinese bought 1.5 million fur coats in 2010 out of the 2.5 million sold worldwide. The country’s market for pelts is expected to be worth 16.42 billion yuan by 2015.